Omni Ecosystems designed, supplied, installed, and now maintains the green infrastructure elements at the new McDonald's Chicago Flagship restaurant. 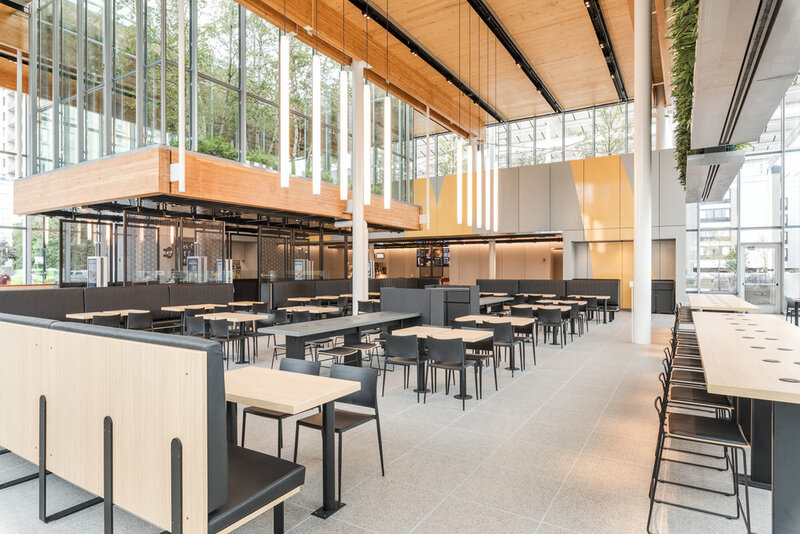 A woody-grove ecosystem, including birch trees with an understory comprised of ferns and sedges, floats in an open-air glass atrium above McDonald's self-ordering kiosks. The suspended shade garden connects the inside of the restaurant with nature. Omni Ecosystems’ ultra-lightweight growing media enables the garden to exist with two columns and cross-laminated beams. Above the dining area, a 792 square-foot living wall by Omni Ecosystems is a visual amenity that improves air quality, dampens noise, and continues the connection between indoors and outside. A rooftop apple orchard, visible to diners through a clerestory window, is a third surprising landscape. The orchard harnesses unused rooftop space growing 15 apple trees of the Gala and Pink Lady varieties. Edible plants comprise the orchard’s understory, including a mix of arugula, broccoli, and carrots. Once harvested, the franchisee intends to donate the produce to a local Ronald McDonald House.